It’s been 1 year since my very first art show and where I officially introduced my work to the community (see blog). I’m pleased to share that so many great opportunities have opened up for me ever since. 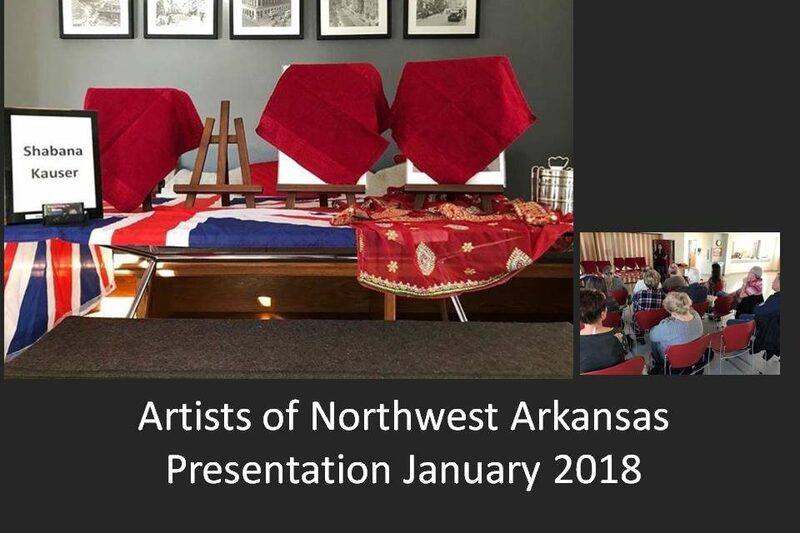 Artists of Northwest Arkansas (ANA) was founded over 20 years ago. 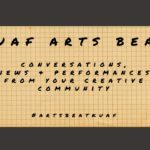 The organization provides resources and opportunities for artists in the area. In January I was invited to be the guest speaker! It’s been a while since I have presented, so this took me out of my comfort zone. I talked about my journey from the UK to the US and how I discovered my love for art. I enjoyed listening to the audience afterwards and learning about their experiences of moving here, their thoughts about my art journey and my work. We took a very limited number of photos, once the presentation began I think we were all focused on that and lost track of time! One of the photos shown in the slideshow above is of my display table, this was taken in my dining room (a few days before) when I was planning for my talk. I covered my work up so I could explain my art journey in a logical way to my audience. This was a great experience for me in so many ways! 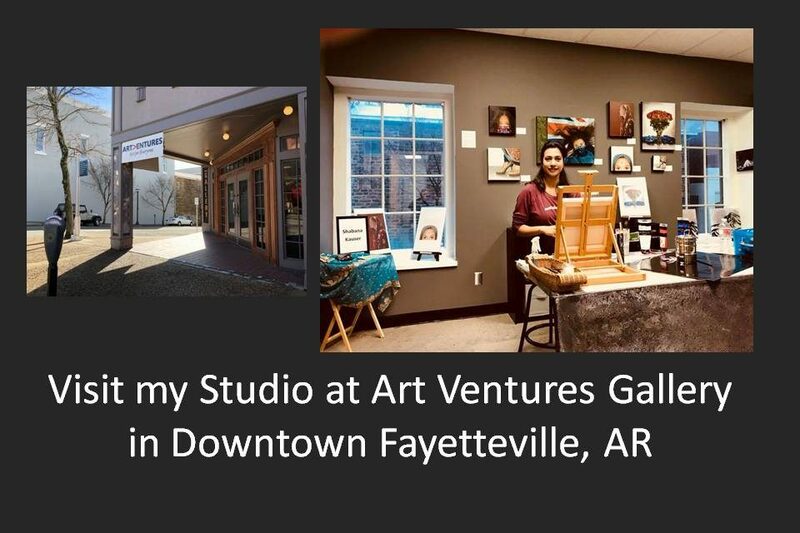 In mid February I moved into a studio space at Art Ventures Gallery on the square in Fayetteville, 101 W Mountain St, Fayetteville, AR 72702 . I have been a represented artist with the gallery for over a year so this opportunity was a perfect fit. Some days you will find me working on new pieces, catch me at various events here including ‘First Thursday’ each month. I will always be adding new work to my studio and moving forward with this fabulous opportunity. 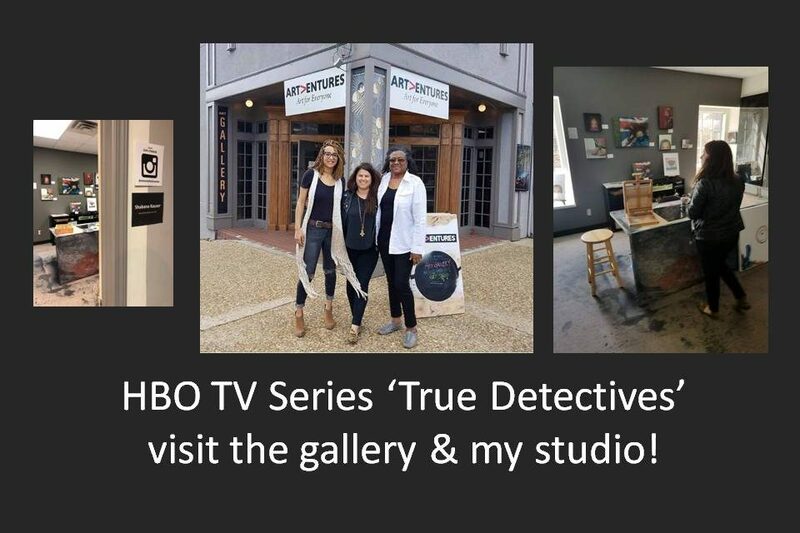 HBO television series ‘True Detectives’ are currently shooting their new series in Fayetteville. 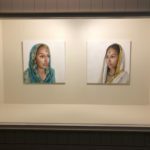 So I was excited to learn that my gallery, Art Ventures had collaborated with them. They visited my studio and checked out my work! 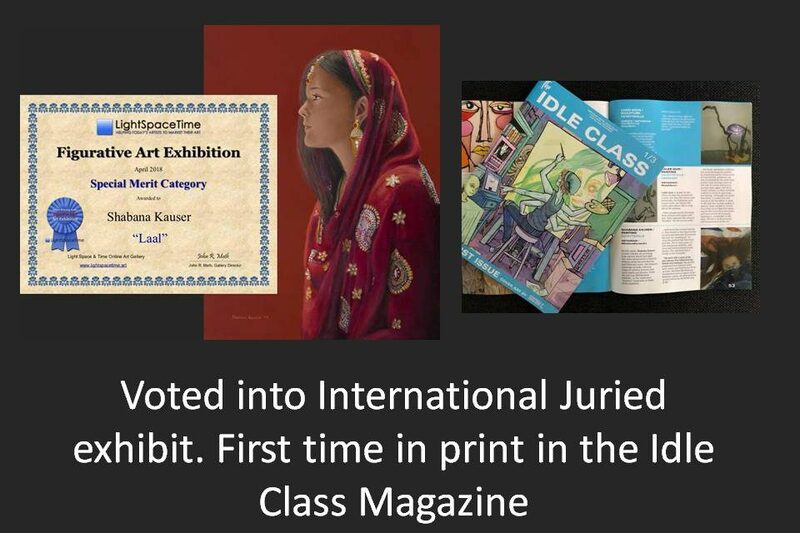 I feel honored to be featured in The Idle Class Magazine, The Artist Issue. I am in the ‘Artist we love’ section. My oil painting ‘Identity’ is shown on the bottom right of the page alongside a write up. It feels amazing to be to see my name and work in print alongside local names that I respect. A big thank you to The Idle Class magazine for selecting me for this issue, I really appreciate it. This magazine is distributed throughout Arkansas. I managed to sneak a few copies into my Studio at Art Ventures Gallery! 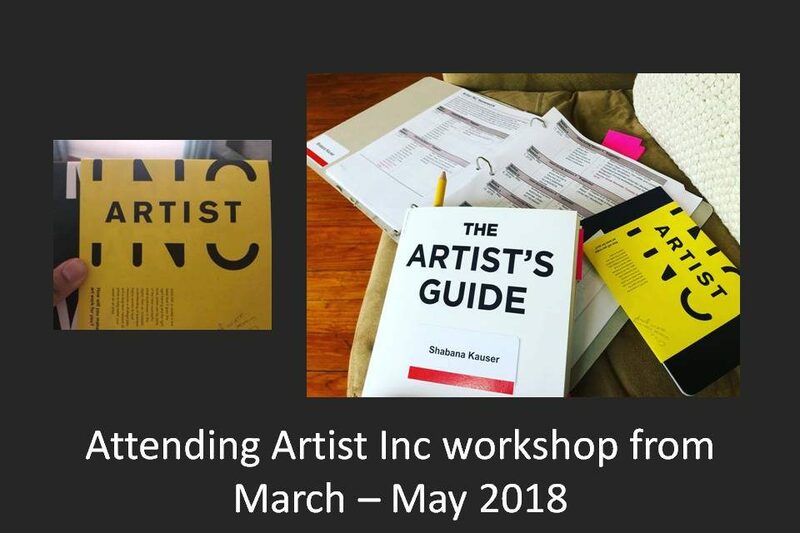 Right now and through to – May 2018 I will be adding to my learning by attending Artist Inc workshops. This is a juried program, designed for working artists. With a limited number of places each year, not every applicant is accepted. I was thrilled when I found out that they selected me as one of the 25 participants this year! 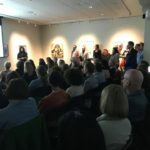 The course in funded by several organizations, including The Mid America Art Alliance…..which means they generously cover a majority of the cost! The program is aimed at exposing working artists to the knowledge and skills required with the business side of art. I always value my learning time and to do this alongside other artists only makes it better!! I will be attending this 8 week long workshop (one evening a week) with a number of local artists I know and I hope to connect with lots of new faces. Thank you Marsha Lane Foster for mentioning this opportunity to me last year, I really appreciate it. Got to love our supportive art community! For more details about Artist Inc. check out this link. I am over the moon to be voted into Light, Space & Time Galleries “8th Annual Figurative” juried exhibition. They received over 600 entries from 27 different countries and 32 states. Not every entry is accepted, so I feel honored to have received a Special Merit Award for my oil painting titled ‘Laal’. This original painting sold a few days before the official reception night at the gallery! I do have prints available for sale at Art Ventures Gallery in Downtown Fayetteville or email me (info@shabanakauserart.com). For more details about this juried exhibit please check out this link. My work has been in a number of local exhibitions around Northwest Arkansas since January this year. Some of my work is currently on display in Downtown Rogers at the Gateway Mortgage Group until April 16 2018. The official reception night is during the community event known as ‘Art on the Bricks’ on Thursday April 12th from 4:3pm. Everybody is welcome, it’s a free exhibit with lots of other events happening within walking distance. Thursday May 3rd 2018, 6pm at First National Bank I will be exhibiting my work while the Bentonville film festival is happening. I am very excited about this opportunity! My art has allowed me to connect with so many different people, awesome artists and curators. Thank you Northwest Arkansas, friends, family & collectors!